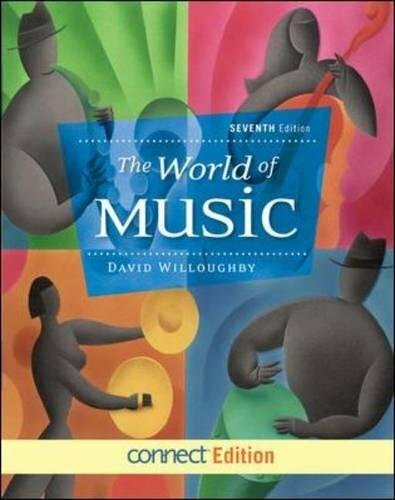 David Willoughby’s popular music appreciation text is now powered by McGraw-Hill’s state of the art digital content platform, Connect Music. Now students and instructors can have access to all the music featured in the text along with a wide range of activities, assessments, and a convenient ebook. These powerful new tools combine with Willoughby’s original and insightful approach to the music appreciation course to provide students with a unique resource that will change the way they listen to music forever. The World of Music is a music appreciation program designed for instructors who want to focus on listening to music as it exists in the real world of their students. With Connect (purchased separately), students now have access to digital content that will improve outcomes and foster better engagement with the music in their lives. Expanding the traditional repertoire used for music study, this popular text begins with American folk, religious, jazz, popular, and ethnic music before introducing some world music and concluding with a thorough overview of Western classical music. The approach captures the essence of each repertoire, and new digital tools equip students to recognize different styles, appreciate their different functions, and possess a solid foundation for a lifetime of musical appreciation. Now with Connect, The World of Music is the ideal program for the most student-centered experience in Music Appreciation.